I have a confession to make: I love honeydew melons. I know, I know, it’s boring and you don’t like it, right? Hear me out. I think that most of us are used to honeydew melon in chunks on a fruit plate, stuck between cantaloupe and pineapple, sort of hard and flavorless. Right? It’s better than that. When it’s ripe, honeydew is a perfect summer fruit. It’s light, only slightly sweet, and juicy. If watermelon is plain granulated sugar, then honeydew is well… honey. The other day, I saw a recipe on one of my fave blogs (A Cozy Kitchen) and knew that I had to make that cocktail into a popsicle. I did some research (your booze/other liquids ratios must be exact or the pops won’t freeze), and decided to go for it. The result is EXACTLY right. 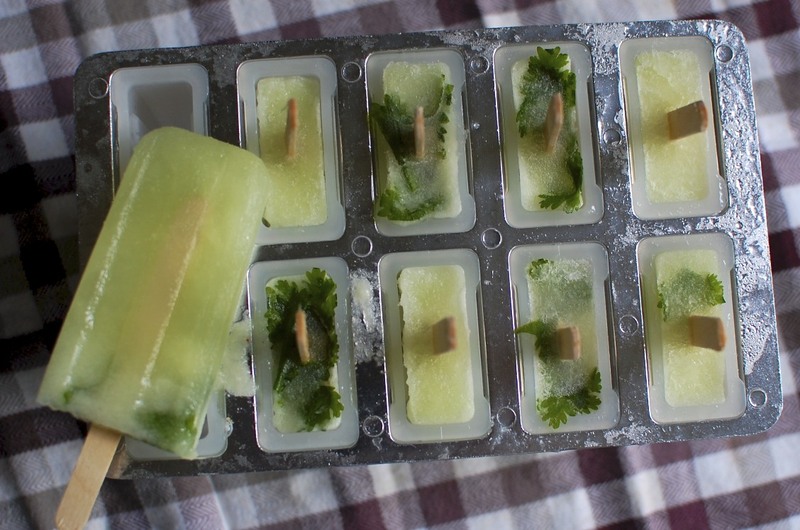 To add a little something extra, I added a few cilantro leaves to each popsicle. 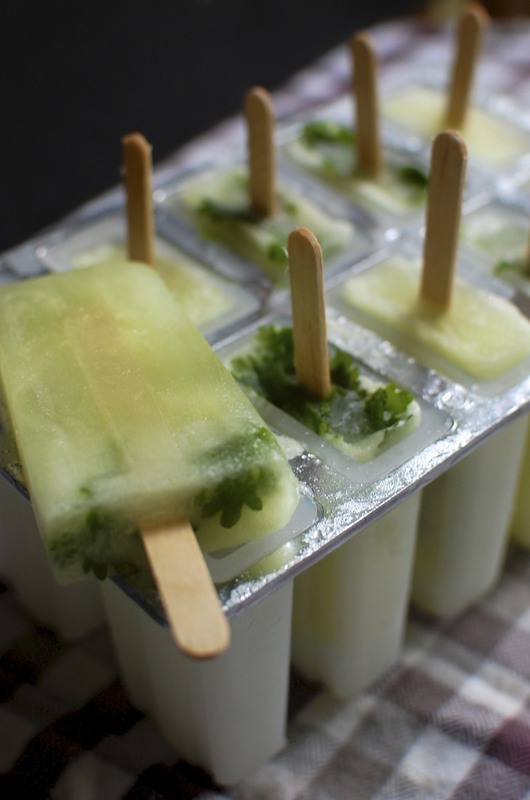 The cilantro gives the whole popsicle a little extra zip–but if you’re one of those “cilantro tastes like soap” people, then basil or mint would be perfect, too. I’m trying real hard to get lots of popsicles and fruity pies in before the summer is over–we’re still getting peaches and figs here, and I’m not ready to let the season go. Soon it’ll be time to pack up the popsicle mold, the days will get shorter and the leaves will change. 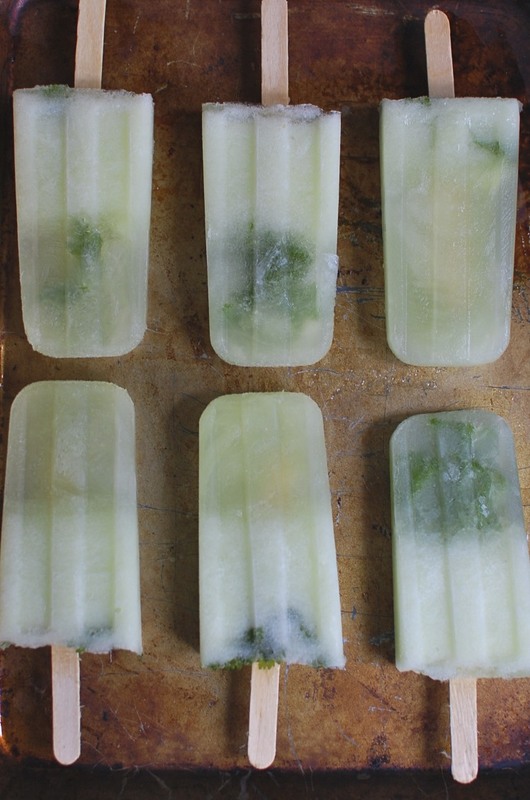 Until then, I’m going to make all the boozy popsicles I can think of. Cup up the honeydew and put it into the pitcher of a blender with the sugar and water. Blend until smooth. Pour in the gin and tonic and mix well. Then, pour the mixture into a popsicle mold (or dixie cups!) and put a few cilantro leaves on top. Then, insert the sticks and freeze for 6 hours or overnight. 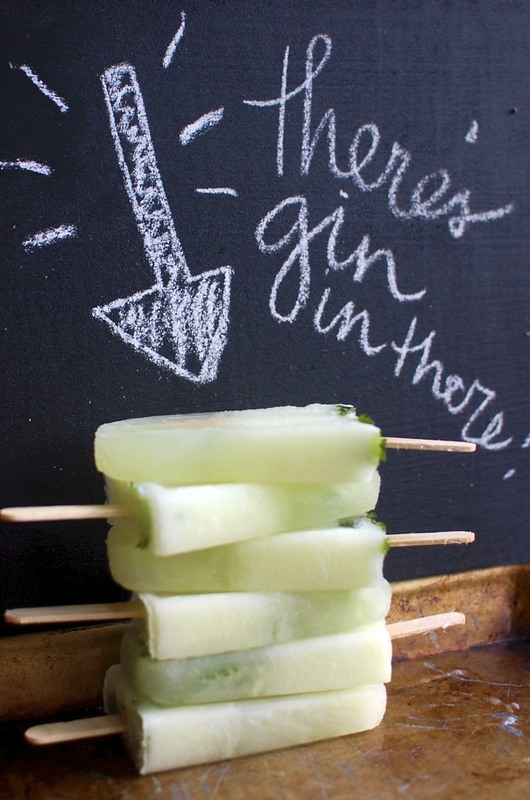 Popsicles with booze will take longer to freeze.